Pears are plentiful during the Fall season and this compote is the perfect way to enjoy them. There are many ways to eat compote. Eat it on its own hot or cold, put it on top of oatmeal or yogurt or even use it as a savory sandwich spread. 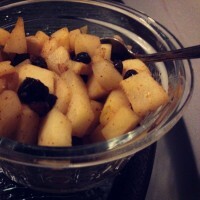 This pear compote is rich in vitamin C and fiber and should keep in the fridge for about a week.